Check out these four ways to get your mojo back when you’re singing the blues. Your body and mind will thank you, and you’ll be able to enjoy your career in the nail industry for years to come. 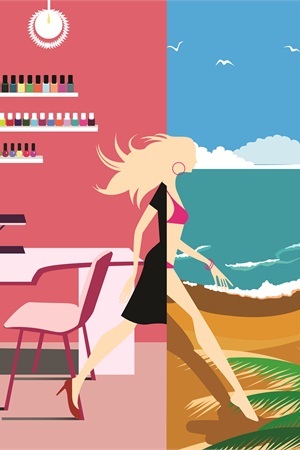 Most nail techs have felt it at one time or another — the intense desire to hop on a one-way flight to a tropical island and never return. When the desire to run away starts to hit hard, there’s no denying it, you’re feeling the effects of burnout. Christina Maslach, a professor of psychology at the University of California, Berkeley, is known for her research on the phenomena, and defines burnout as “a response to stress within the workplace, which can result in extreme fatigue and the loss of passion for one’s job.” The effects can be devastating. People who suffer from burnout have higher instances of depression, anxiety, and conflicts with coworkers, as well as having lowered productivity and decreased satisfaction with their jobs. The prolonged effects of burnout can lead many nail technicians to quit their jobs, sometimes leaving the industry altogether in search of less stressful careers. The good news is you can keep your job and get your mojo back with these four simple approaches to keeping yourself inspired and stress-free. If you find you can’t get away for a few days, not all hope is lost. The Internet is an excellent resource for learning new techniques and trends. “When I am feeling burnt out at work I like to visit my fellow nail technicians’ pages on Facebook, or even watch some YouTube videos to get me inspired,” says Sara Khalaf of Nails by Sara in Romulus, Mich. Other websites like Pinterest and NAILStv are also overflowing with inspiration and tutorials. Sometimes, just seeing how another technician performs a service can help you iron out the kinks in your application, or give you ideas to help you make improvements. “There is strong evidence that a lack of social support is linked to burnout,” says Maslach. “People thrive in a community, and function best when they share comfort and happiness with people they like and respect.” So it’s important to have people who understand not only what you do in the salon, but also the unique challenges presented to those who work in the industry. In fact, studies have shown that professions in the service industry are particularly demanding, and that emotional exhaustion is a common response to job overload. Often, as manicurists listen to their client’s personal woes during nail appointments, their natural compassion and empathy needs to be kept in check by distancing themselves emotionally. However, too much distance can cause a person to become cynical and react to clients in a negative or callous way. So it’s important to find a way to rid yourself of the emotional baggage clients sometimes leave behind, but in a positive way. A relaxing spa treatment, or even a vigorous workout session, can often do the trick. It’s important to understand that once you feel the tell-tale signs of burnout, a certain amount of emotional and physical damage has already been done. Additionally, the more often you feel it, the more disillusioned you can become with your job and your career as a whole. Vicki Strom, owner of Nails by Vicki in Racine, Wis., knows the most effective way to manage burnout is to stop it before it starts. “I love doing nails, but I also know that I want to work to live, not live to work,” she says. Make sure you’re not overbooking your days, take time between clients to get a drink, take a short walk, or have a moment to yourself to just breathe deeply and collect your thoughts. Not only will it improve your mood, but giving your body a chance to reenergize between clients will also keep your quality of work consistent throughout the day. Lastly, always obey the cardinal rule for preventing burnout. Be realistic, and know when to say when. Only accept an amount of work that is challenging, and if your days start to become overwhelming, it’s time to make some changes. “Most of the time I can feel myself getting close to burnout,” Strom says, “so I know that I may have to stop accepting new clients for a while.” It can be difficult to say no to a new client and more revenue, but when you overextend yourself, you may suffer the mental and physical side effects as a result. Maslach cautions in her research that burnout is considered a product of occupational stress, and the health problems associated with stress, such as high blood pressure and chronic headaches, can also be found in people suffering from work-related burnout. Consequently, you should always take steps to stop burnout before it starts, to ensure a long healthy career doing a job you’re passionate about. Nail tech Anne Schlegel is the owner of Nailed It! (www.naileditsalon.com) in Racine, Wis.